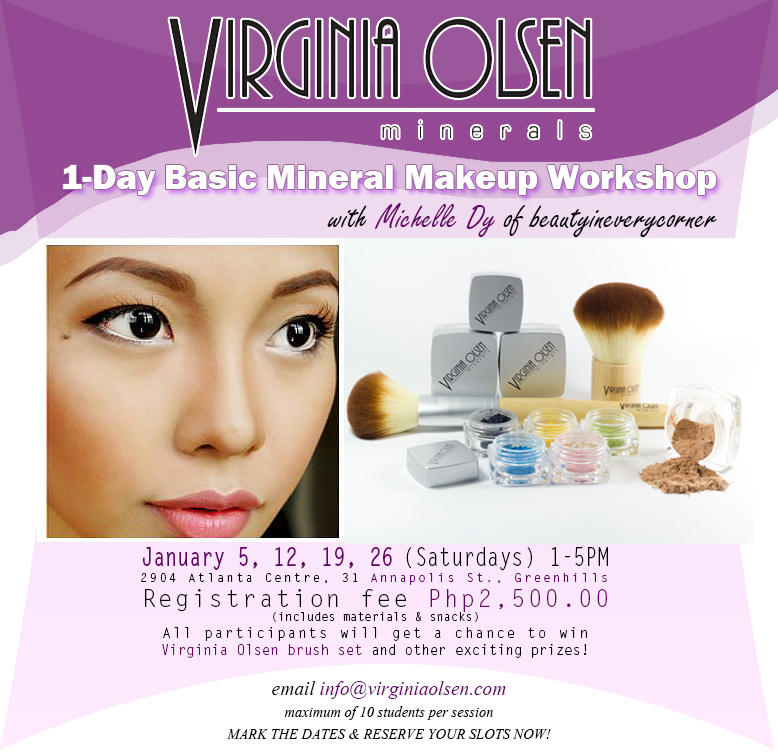 Gelleesh: Learn the Basics in Mineral Makeup Application! Learn the Basics in Mineral Makeup Application! Happy New Year people! I know you’re like expecting me to write a 2012 closing post, just like what I did last year, and maybe a Hello 2013 post, but that’s just so cliché so I will leave that to my personal blog page: Gelleesh.tumblr.com. Yes, I did make a Tumblr for my personal stuff, remember? Anyway, I hope you all had a wonderful New Year ’s Eve celebration because ours was kinda sucky. Hahaha! Will tell you guys all about it in my personal blog post in Tumblr but right now, I’d love to tell you guys about awesome news. Remember my announcement about the Virginia Olsen workshops for December? Well, good news for those who weren’t able to join the December batch because they’re opening new workshop slots this January! Time to learn the basics of Mineral Makeup with Makeup Guru Michelle Dy. I need to still check my schedule because early 2013 will be a very busy time for me at work. But I hope that you’d grab the opportunity to learn the basics because, you know, fundamentals matter! It’s an opportunity you shouldn’t miss! Make the most out of your 2013. I’ve got so much planned ahead for my 2013 and I hope I can cross ‘em all out of my checklist... Wait, cross on a checklist, check rather! Err... Hahaha! Nevermind. Oh, the dates. Yes, the dates! So Michelle Dy (Youtube: http://www.youtube.com/michelledy051 || Blog: http://www.beautyineverycorner.com) will conduct the workshops on January 5, 12, 19 and 26 at Unit 2904 Atlanta Centre, 31 Annapolis St., Greenhills, San Juan City. Registration fee is only PhP2,500 and it already includes the materials and snacks. Plus, there would be a special raffle draw at the end of the workshop wherein participants could win Virginia Olsen prizes. And just a reminder that only a max of 10 students per day is allowed do go shoot them an email now at: info@virginiaolsen.com to reserve your slot, kk? wishing you an amazeballs and blessed 2013 :)! 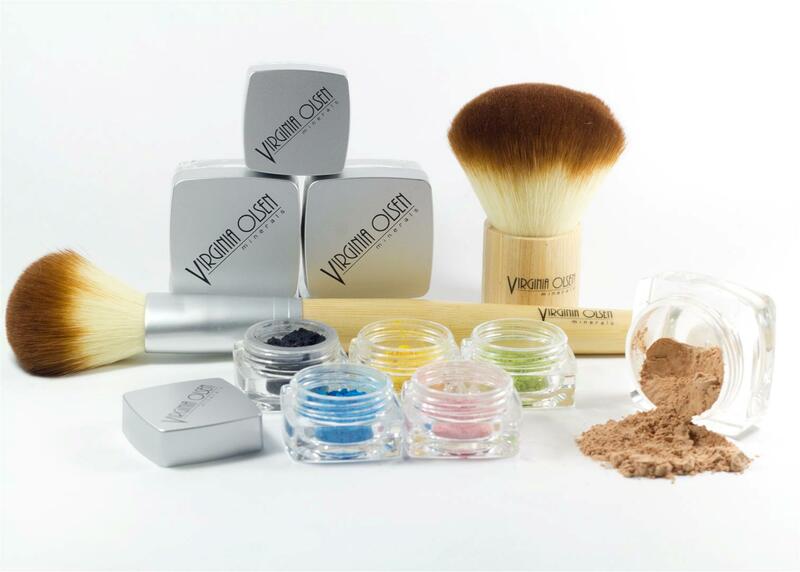 ooh mineral makeup! I haven't been to a makeup workshop forever... I would love to if there's one near my place!